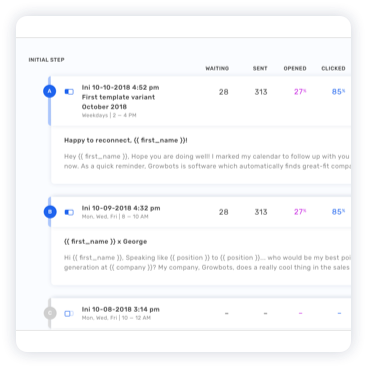 Growbots: An Outbound Sales Platform to Get New Customers Faster. Get a tailored list of all your potential customers instantly. It’s not magic, it’s AI. Create personalized emails and schedule your campaigns. All emails will be sent automatically along with followups to reach your prospects at the right time. Our recommendation system will only suggest prospects matching your most responsive prospects. 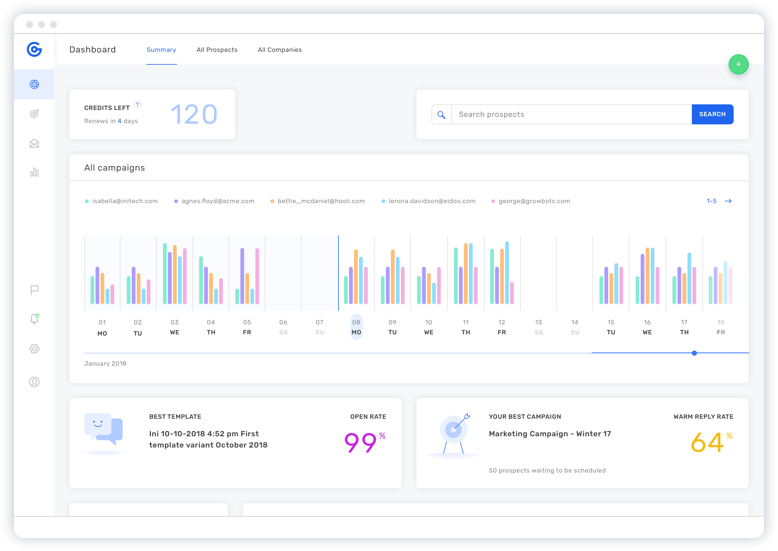 Improve your campaign results by up to 40% within a month. Growbots will save you over 4 hours a day on prospect generation. Access over 200 million contacts. Growbots will identify your perfect customers. Target specific companies, or use our extensive targeting criteria to get a list of all companies matching your profile. You can also import your own prospects to Growbots. Our database is updated continuously thanks to live email verification. Every email you send makes Growbots more accurate, resulting in high email deliverability (bounce rate below 10%). Get detailed prospect information to personalize your emails. Because personalization at Growbots means more than a few custom fields. Quickly and easily test different elements of your campaign, like email template variants, sending times etc. Find out what works for you. Create team accounts to collaborate on campaigns. View campaign results across your team to identify high performers and share best practices. Get access to detailed reports; monitor your open rates, click-through rates, and positive response rates. We will identify your best performing campaigns and email templates, so you can reuse them later. Growbots makes sure you never contact any of your existing customers with your outbound campaigns. 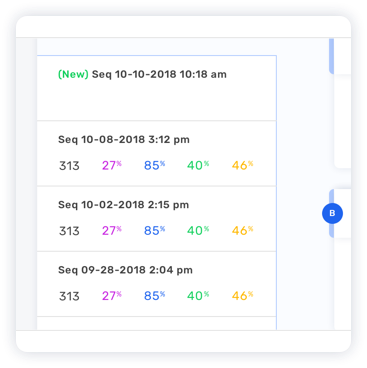 Customized field-mapping allows you to choose exactly what information you’d like to update in Salesforce or HubSpot, based on Growbots campaign and prospect data. Track information on your contacts and accounts. 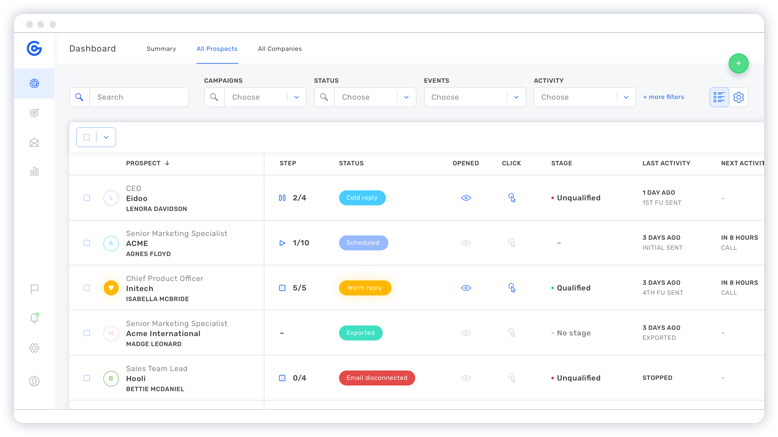 You decide whether you want to categorize your prospect as a lead, or as a contact. We will match your process. 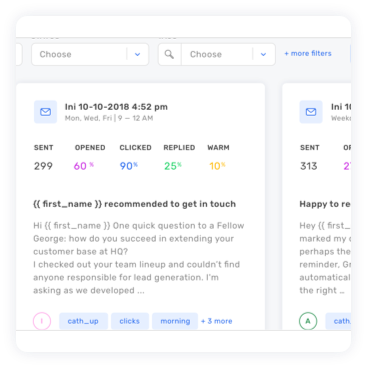 Add your Salesforce or HubSpot leads or contacts to your campaigns at Growbots. We will automatically stop the campaign if we register your prospect converting outside of Growbots. 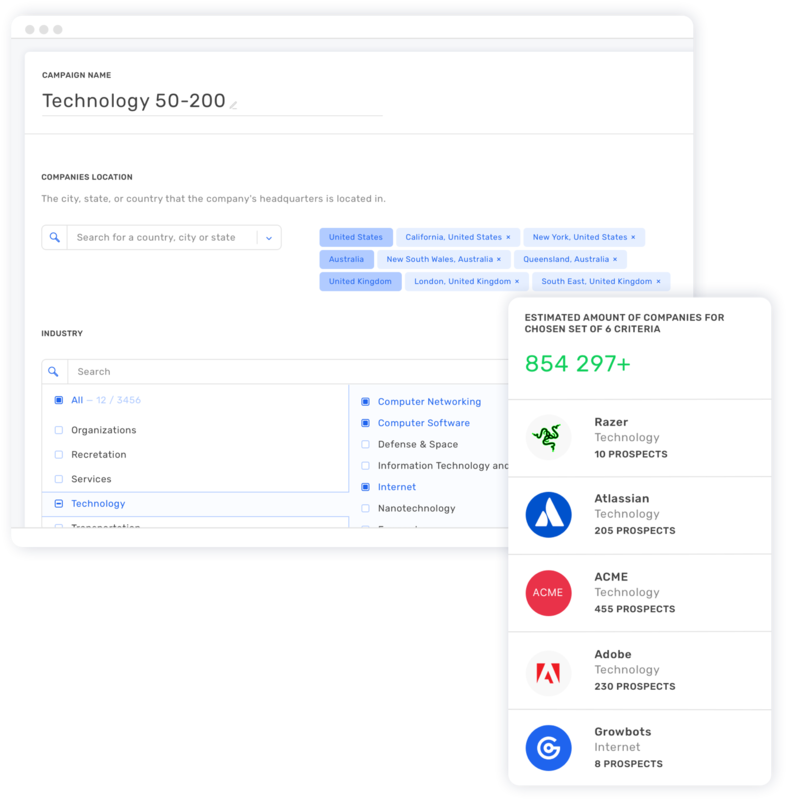 If you’re using a CRM other than Salesforce or HubSpot, you can import and export CSV files from/to Growbots, and upload them into your CRM system. Alternatively, you can use the BCC function in Growbots, to have all emails logged into your CRM. How much does Growbots cost? 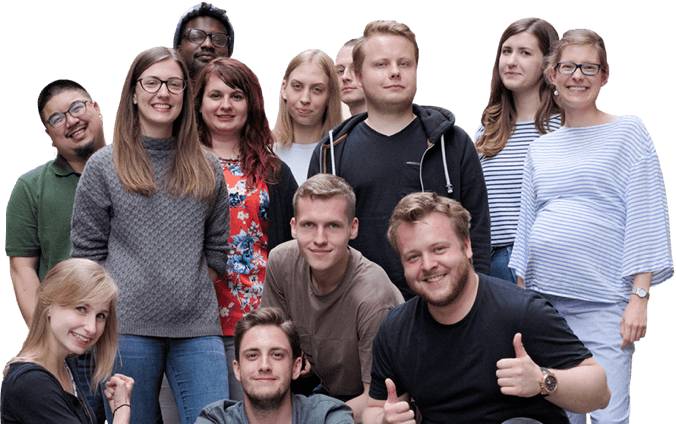 Customer Success Team in the world? who will regularly feed you with delicious knowledge on effective outbound campaign management. We take your success very personally! Feed your pipeline with fresh leads.